Resurfacing driveways can only be done by professionals. So if you decide to resurface you’re driveway, it is better to hire a good contractor to do this job. Driveway resurfacing has a lot of variety since there are different types of driveways found across the globe. It is up to you to choose the right surface on your driveway that will perfectly fit your lifestyle and you’re home. If you are no longer happy with your current driveway’s surface, even if it is not yet broken, you have the freedom to redecorate and resurface it. You can transform your dull, boring driveway into something bold and new. Furthermore, you have to consider the damage in your driveway’s surface. If you think that your driveway is beyond fixing, you should consider replacing it entirely rather than just resurfacing it. Driveway resurfacing is a procedure wherein the driveway’s surface is being fixed and restored. There are lots of different ways to resurface a driveway. It depends on what kind of driveway you have and how much damage it has. Modernization and innovation made it easier to resurface driveways nowadays. You now have a variety of options to choose from. There are various types of driveways found in Sydney. But all driveways share a common weakness. At some point in time, they will break, crack or get loose. Cracks and holes on the driveways can cause serious accidents and severe injury. Driveways are needed to be maintained properly to avoid these kinds of contingency. It needs to be replaced or resurfaced to be able to have that clean, smooth and most importantly, safe surface. When Will You Resurface Your Driveway? The first thing you should look out for are tiny holes and cracks. These will become bigger holes and will eventually break especially when an earthquake occurs. Adverse weather conditions can cause breaking and cracking of your driveway’s surface. Even small vehicles can make these tiny holes and cracks bigger over time when not immediately fixed. Depending on the type of driveway you have, you also have to consider the intensity of the damages found in your driveway. Washing the driveway prior to resurfacing is a prime importance. Holes and cracks are covered with fabric, basecoat and concrete. 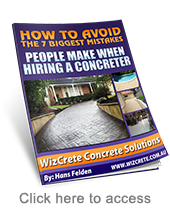 Smoothen it out first then a reliable contractor, like Wizcrete, can start resurfacing you’re driveway.